The Chilkoot River flows into Lutak Inlet, and is one of the more easily reached bear viewing spots in Southeast Alaska. Salmon spawn in the Chilkoot each year, attracting brown bears between mid-June and October, with July and August the peak months for bear viewing. River otters and harbor seals chase salmon upstream at high tide. Common mergansers, Barrow’s goldeneyes, harlequin ducks and other waterfowl feed at the estuary where the Chilkoot River flows into Lutak Inlet. In the spring and fall, large numbers of shorebirds flock to the estuary mudflats to refuel before continuing their annual migrations. American dippers feed on aquatic invertebrates and small fish throughout the year. Salmon occasionally pool up in shallow areas of nearby Chilkoot Lake, and you may spot brown bears fishing along the lake as well as the river. 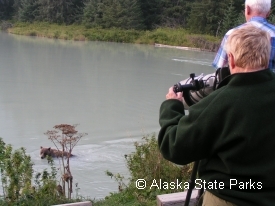 Naturalist-guided tours (ask about wheelchair accessiblity) to the Chilkoot River are available during the summer, some of which combine the river and Lutak Road into one wildlife viewing excursion. There is a maintained campground and parking area at Chilkoot Lake. The Chilkoot River is North and West of downtown. Follow Lutak Road away from town until it eventually narrows and paralells the river, ending up at Chilkoot Lake.